Over the years industry certifications have helped software developers improve their skills and to stand out in the crowd and have also given employers a good measure of the skill level of candidates. Like other technology vendors, Oracle offers certification for one of its most emblematic products: the Java programming language. In this post you’ll learn what the Oracle Java Programmer certification is, how you can get it and the benefits you can expect from getting this recognized credential. 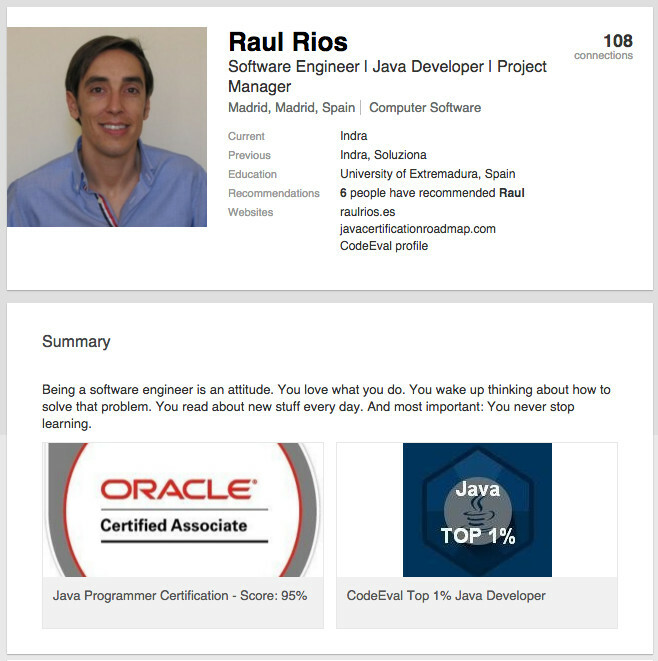 What Is the Oracle® Java Programmer Certification? The Oracle Java Programmer certification certifies programmers on skills and knowledge related to the Java Programming language. When you become certified, Oracle verifies that you have a base set of knowledge and skills that enables you to develop software using Java. The certification is a good benchmark of knowledge and expertise. What better way to show your Java skills that having them validated by the company which develops the Java language itself? 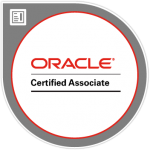 Oracle Certified Associate (OCA) is the entry-level certification for Java programmers. It helps you build a foundational understanding of the language while expanding your knowledge of general programming. You’ll learn (or reinforce) the basics of the language (variables, data types, arrays, loops, classes, methods, exceptions) and also some not-so-basic topics (implicit narrowing, explicit casting, autoboxing, nested classes, polymorphism and inheritance, abstract classes and interfaces, and some specific APIs to deal with collections, strings and calendar objects). Oracle Certified Professional (OCP) builds upon the fundamental OCA skills and demonstrates a high level of knowledge and skills. It deals with more advanced topics like design patterns, generics, File I/O (NIO.2), JDBC, threads and concurrency. While you can get the OCA even having little or no previous experience working with Java, in my opinion getting the OCP needs to be backed up by some hands-on experience. You can think of a Java Certification as a way to invest in your career and to help boost its potential. By getting the certification you’re going to improve and update your knowledge of the Java language and it will also be a differentiating element from other programmers who don’t have this credential. So whether you’re an experienced Java programmer or a beginner or you’re looking for your first job as a programmer, the Java Programmer certification will be positive for your career. I myself was an experienced Java developer when I decided to study to get the certification. My main motivation was to update my skills, since the last (and long) project I had been working on was developed using Java 5, and however the last available version at that moment was already Java 7. I had a growing feeling that my Java knowledge was getting out of date and I felt the need to catch up. Not only that: I felt the need to demonstrate in some way that my Java knowledge was totally up-to-date. In my case it was clear: this certification was the way to reach what I was looking for and the truth is, looking backwards, I think it was a very wise decision for my career. If you’re a beginner you’ll learn a lot and will notice a huge boost to your knowledge. If you’re an experienced programmer you’re going to reinforce and learn new details about the aspects of the language you already know. You’ll also learn the new features of the last version of the language (e.g. Lambda expressions) and finally you’ll learn the advanced concepts you still don’t know that will expand your skills. How Can I Get the Certification? In few words: you have to pass an exam. Or two, if you target the Oracle Certified Professional certification (obviously in order to be eligible to do the exam for the OCP you must first get the OCA). For further details about the exam topics you can check the official Oracle University web site (exam I and exam II). 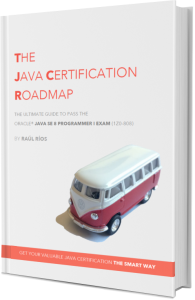 You should also know that Java 9 has just been released (September 2017), but from that point on, Oracle usually takes its time to release the certification exams (first there is a several-month period intended for beta exams). Based on previous Java exam releases, my guess is the Java 9 Certification exams will be released some time in 2018. In case you need more information, check this complete step by step guide about the whole process, including screenshots and all the details. Upon completion of your exam, results will be available on Oracle’s CertView certification portal. You’ll get an email from Oracle shortly after finishing the exam letting you know about it. Why Are There Two Exams? Before Java 7 there was only one exam and certification, originally called Sun Certified Java Programmer (SCJP, exam CX-310-065) and later changed to Oracle Certified Professional Java Programmer (OCPJP, exam 1Z0-851). What was the reason to split the certification into 2 exams? On one hand, if you think of the large list of topics included in the Java 6 exam, it makes sense. With just one exam, getting the certification was an overwhelming task for many people. Having two exams allows you to establish more achievable goals and also to have a first certification (OCA) in less time. The exam involves answering simple choice (radio buttons) and multiple choice (checkboxes) questions. Most questions involve dealing with a code sample that you must review (and most times guess if it compiles). For simple choice questions, the difference between one answer and another is sometimes subtle, ​so ​choosing the right one requires a good understanding of the language and the base Java APIs. For multiple choice questions you must select all the right answers, without missing any or adding any extra one. The good news are that you will be told how many right answers are expected (this wasn’t this way some years ago, adding an extra level of difficulty). The computer you use to take the exam only runs the testing software and no other applications (browser, calculator, etc) are available. No reference material is allowed in the exam. You just will be given a pen and some scrap paper. What does the following code print? Here, an intentional wrong indentation is used to check if you pay attention to details. This indentation doesn’t help you to match every if with its corresponding else. The else at line 4 corresponds to the if (true) statement at line 2 and not to the if (false) at line 1 (as it could be inferred from the indentation). The final output of this code is nothing: lines 2 to 6 are never reached. ​In conclusion:​ is it hard to pass the the exam? From my own experience I would say that passing the exam is not as difficult as you may think. Yes, it covers a lot of different topics but we programmers are used to studying and learning new things every day. There are always some tricky questions in the exam, ​but since ​the passing score is 65% you won’t need to correctly answer each and every question. ​All this being said, one thing is clear: passing the exam requires preparation. In my experience, the best resources you can use ​to prepare for the exam​ are a combination of a book and an exam simulator. ​A good book will teach you everything you need to learn about the​ exam topics​, including the tricky details,​ and the simulator will complete your preparation​ by allowing you to practice exam questions​. While a book by itself ​might be enough to prepare for the exam, I strongly recommend that you use a simulator. This is a fundamental part of your preparation and serves also as a validation of the learned content. People usually ask me how long does it take to prepare for the exam. Well, it depends on how much free time you have to study and how much you want to spend doing it. Most people usually say that a lack of time is their main reason for not to starting something new. I think all of us can relate to that because we all have always so much going on in our lives (family, work, exercising, leisure, …). But I will tell you something: back in 2013, when I was preparing for my exam, I was working full time (8am to 6pm). I also used to go to the gym 3 times a week, played a basketball game every Tuesday evening and attended to English classes on Monday afternoons. ​What do I mean? I just mean that reaching your goal is not so much about how much free time you have as it is about your motivation and perseverance, and also about setting a realistic goal. It took me more than 3 months to prepare for the exam. Since I was perfectly aware of my own free time limitations, it didn’t make sense pushing myself to get the certification in a shorter period of time (in fact, it had been counter-productive). I finally got my certification with a score of 95% and if a simple Java programmer like me can do it, so can you. Although you have little time available to study, the important thing is to appropriately plan ahead that time and then make the most of it. way to reach ​my goals. I’m totally convinced of its advantages, but in order for you can make your own decision, I’d like to tell you what potential benefits are reasonable to expect from achieving this certification and also (and perhaps even more important) what you shouldn’t be expecting from it. This is undoubtedly the most important benefit you get and so it should serve as your biggest motivation through the studying process. I can tell you that once you start studying, you soon get to realize that the time you spend doing it is by no means wasted, but instead very worthwhile. The exam covers all aspects of the language, even those that you usually avoid, use seldomly or get right but don’t know why (e.g. exact operator precedence, implicit casting rules, all variants of inner classes…). Studying for the exam forces you to think through and learn these aspects deeply, so later on you don’t get distracted by such issues so much. You’ll dig into the language details far more deeply and comprehensively than you would ever do on your own. I can assure you that even if you’re an experienced programmer you’re going to learn new and interesting things, not only about the new features released in every new Java version, but also about the Java features you think you master! Let’s be clear: a Java certification by itself is not going to get you a new or better job… but it can help. Hiring Managers and recruiters often search for candidates with a Java certification because they know that if you have this credential you should, at least, have an above-average knowledge of the Java language. This gives you a competitive advantage that helps you stand out of the crowd. That said, while the certification makes you more visible and gives you a greater chance to pass the first cut of candidates, it doesn’t guarantee anything else. To get a job as a Programmer or Software Engineer, you will still have to prove your skills and experience during the whole interview process. What about internal recognition or promotion? Is getting a Java certification going to help you earn a promotion? Well this is, of course, company dependent. Nevertheless, by deciding to get a Java certification and letting your company know that you’re doing it, will show them that you care about your skills and therefore care about your work, and that’s always good. In fact, you should ask your company to pay for the cost of the exam. If your company pays for it, it’s not only supporting your career growth but also bringing value to the organization itself by improving its employees’ skills. So ask your manager or Human Resources: you will be surprised by how eager companies are to help improve their programmers skills. The Oracle Java certification has been traditionally considered over the years as one of the most recognized certifications in the IT world, so it feels good to earn a credential like this. It’s not only about having a new highly valuable bullet point to add to your resume and your LinkedIn profile, but also about getting your knowledge validated, and that’s always very fulfilling. As stated before, by getting the certification you will get a much better knowledge of the Java language, but good programming is not only about mastering a language. There is much more about it: design patterns, clean code, algorithms, testing, tools, development process, etc. At the end of the day, constantly learning and programming every day incorporating what you’ve learned is what will make you a better programmer. The Oracle Java certification has been traditionally considered over the years as one of the most recognized certifications in the IT world, so it feels good to earn a credential like this. Whether you’re an experienced Java programmer or a beginner (in which case you will notice a bigger boost to your knowledge), the Java Programmer certification will be positive for your career. Your main motivation should be to improve and update your knowledge of the Java Language, while at the same time getting it validated with a credential highly recognized by the software development community. However you must keep in mind that getting a certification like this doesn’t happen overnight: it requires preparation and takes some time and effort. A good book and an exam simulator are the best resources you can use to prepare for the exam. The best way to approach your preparation is by setting a realistic goal, plan ahead​ the​ time ​you want to spend studying ​and then make the most of it. That’s all! I hope you’ll find all this information useful, but if you still have some questions, you can drop me a line and I will be pleased to help you. That’s all coders! If you have any comments or questions, you can drop me a line or leave a comment below and I will be pleased to help you. 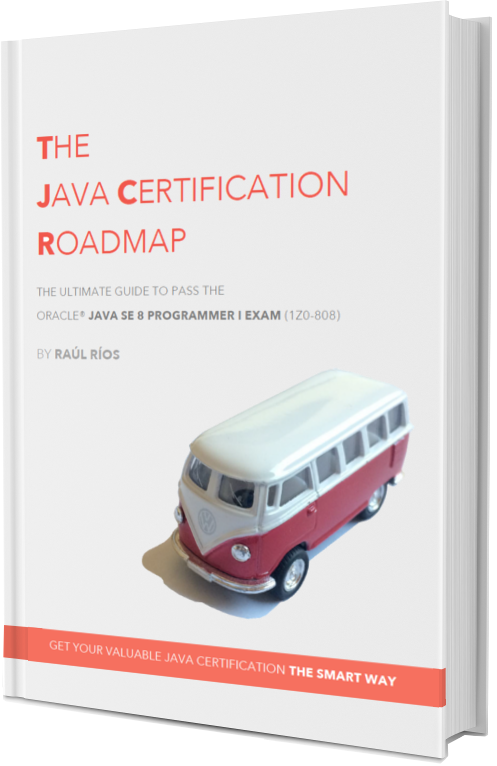 In case you’re looking for a complete (but still short, precise and to-the-point) study guide to help you get your valuable Oracle® Java Programmer certification, including many tricky real-exam-like questions, study sheets, and other bonuses, then the Java Certification Roadmap book is your book. Finally, if you found this content useful and know more programmers, colleagues or friends that may be interested in getting the Java Certification, click one of the buttons belowclick the button on the bottom left corner of your screen to let them know about the Java Certification Roadmap. Happy coding and good luck! © Copyright The Java Certification Roadmap. All Rights Reserved.